Previously, when a user ran Setup and enabled ELSA, they would be able to log into ELSA and view OSSEC *archive* logs (the raw logs received by OSSEC) but they wouldn't be able to view OSSEC *alerts* (created based on OSSEC's analysis of the incoming logs as configured by the OSSEC ruleset). 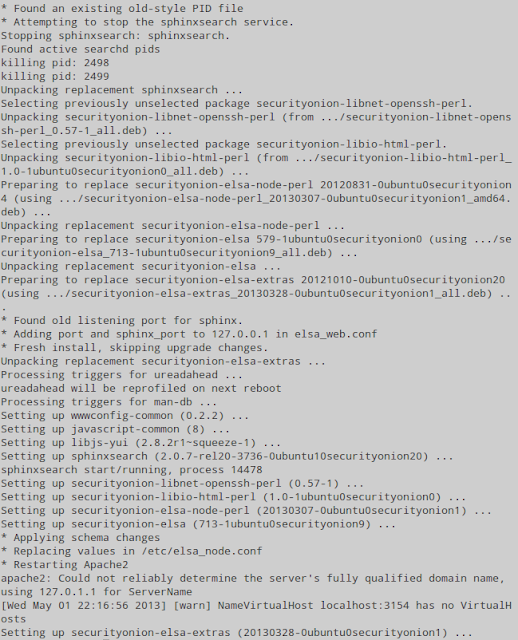 I've pushed a new Setup package that will configure OSSEC to send alerts to local syslog if the user enables ELSA. The new package has been tested by Matt Gregory. Thanks, Matt! Under certain conditions, some Sguil agents may fail to reconnect to sguild properly. 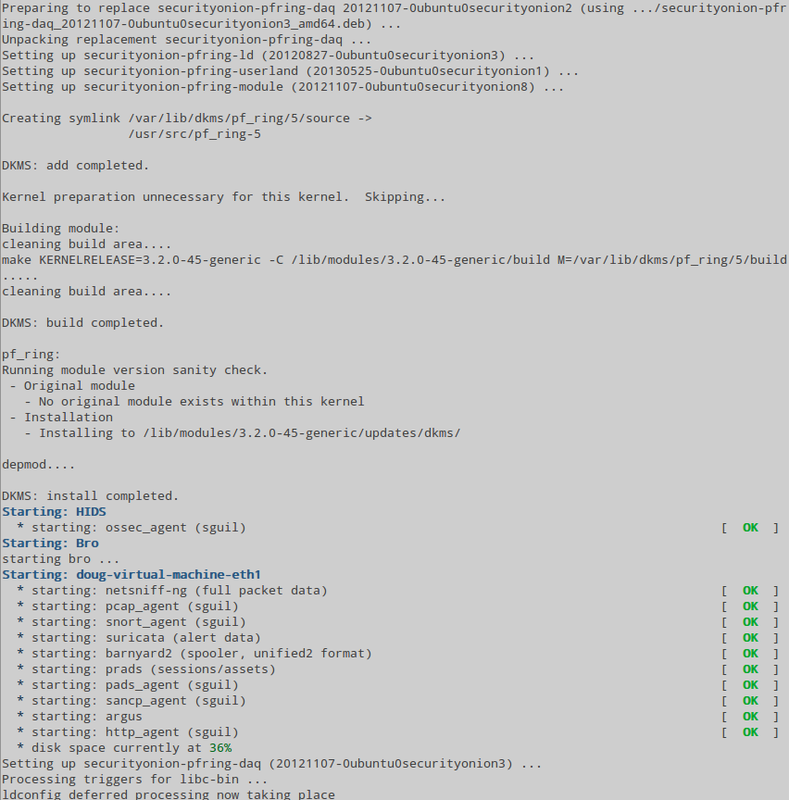 I've added daily cronjobs to /etc/cron.d/sensor-newday to restart all Sguil agents to help alleviate this. When the new securityonion-snorby package installs, it should restart Apache and, if Setup has already been run, it should run "bundle exec rake snorby:update" and restart the Snorby worker as follows (you can disregard any "Jammit Warning" messages). Apply any local customizations to snort.conf file(s) and then run "sudo rule-update"
Some of the pcaps have file extensions other than .pcap, so the default Ubuntu AppArmor policy won't allow tcpdump to read them. This package will automatically update the AppArmor policy to fix this. Please note there is a bug in Bro 2.1 when monitoring multiple interfaces with PF_RING that results in traffic loss. If you're monitoring multiple interfaces, we'll configure Bro to disable PF_RING load balancing to avoid this issue. We'll record your desired number of PF_RING CPU cores for when Bro 2.2 is released. The new package has been tested by Matt Gregory. Thanks, Matt! Issue 299: sphinx.conf - swap "3307" with "9312"
UPDATE 5/3 21:18 - We have reports of issues with the sphinxsearch upgrade. Please do not upgrade until we've determined the root cause. UPDATE 5/4 00:05 - We've determined the root cause and are trying to determine the best fix. UPDATE 5/4 13:00 - We're currently building a new package. Will update later today after it has finished building and has been tested. 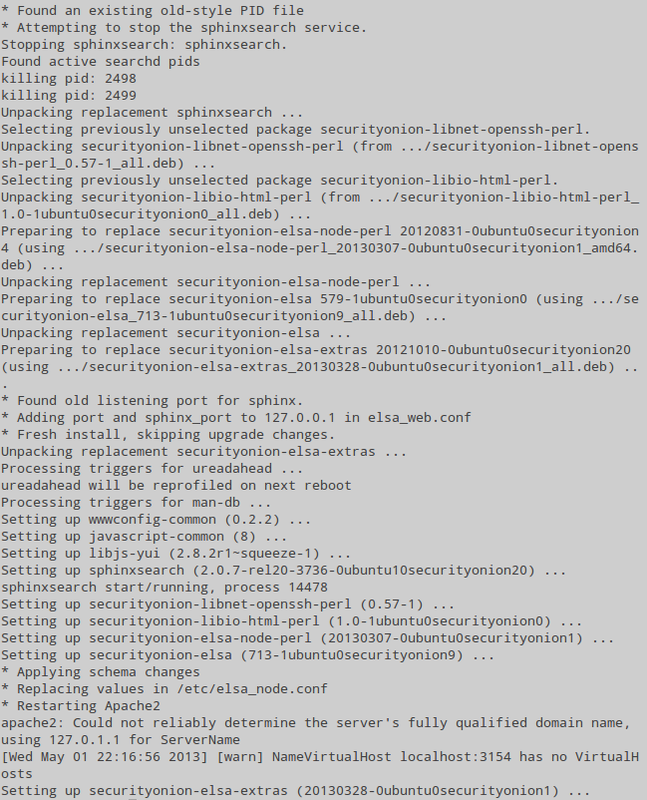 UPDATE 5/5 08:24 - The new sphinxsearch package has had some initial testing which appears to be successful. If you can test it in a non-production environment, we'd appreciate any feedback on our mailing list. UPDATE 5/7 07:21 - Added the "Cleaning Up Perl Processes" and "Rebuilding Indexes" sections below. UPDATE 5/7 09:45 - Added the "Known Issues" section below.